It seems that Fela Kuti's career as a musician and purveyor of the term 'Afro-beat', became more than colourful when he discovered politics and dared to confront the corruption in his homeland upon his return from England, yet the Nigerian's testiest years are barely touched upon in this exhilarating West End production - it's all about the song and the dance.  The press have, for the most part, heaped praise upon 'Fela!' and the packed houses seem to be proof that the show is a Kuti above the rest (sorry). If you missed the chance to see the production at the Olivier Theatre during its current run, you'll be glad to learn that the run has been extended well into the New Year, with another seven shows set to run from 11th to 23rd January 2011. Tickets have now been released for the performances, priced between £24 and £44. The show's plot follows Fela Kuti's short time in England learning his musical trade, before heading back to Nigeria and becoming pretty much an outlaw, inciting uprisings at his concerts and attracting the attentions of the authorities, particularly the military. The spirit lives on, it seems!